VFA-103 "family line" was established in May 1952 and began the transition from F-4S Phantoms to the F-14A Tomcat in January 1983, then to the F/A-18F in Dec 2004. This is the first cruise patch they issued. 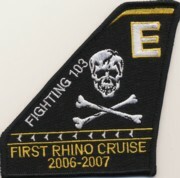 It says "First Rhino Cruise 2006-2007". This patch does not come with velcro attached. VFA-103 "family line" was established in May 1952 and began the transition from F-4S Phantoms to the F-14A Tomcat in January 1983, then to the F/A-18F in Dec 2004. 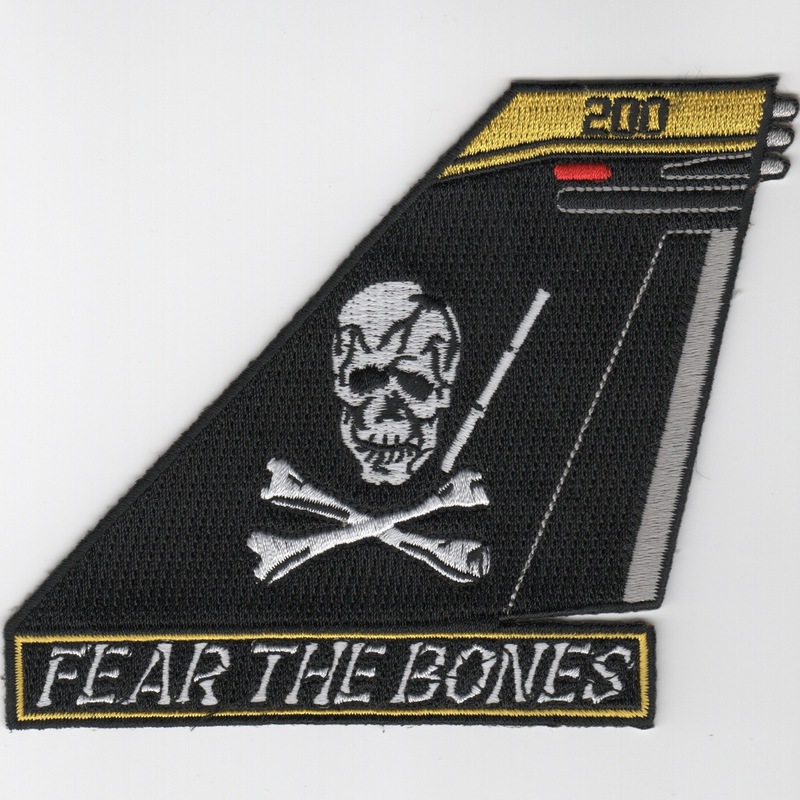 This is one of their "TAIL FIN" patches they created, and it says "FEAR THE BONES". This patch does not come with velcro attached. VFA-103 "family line" was established in May 1952 and began the transition from F-4S Phantoms to the F-14A Tomcat in January 1983, then to the F/A-18F in Dec 2004. 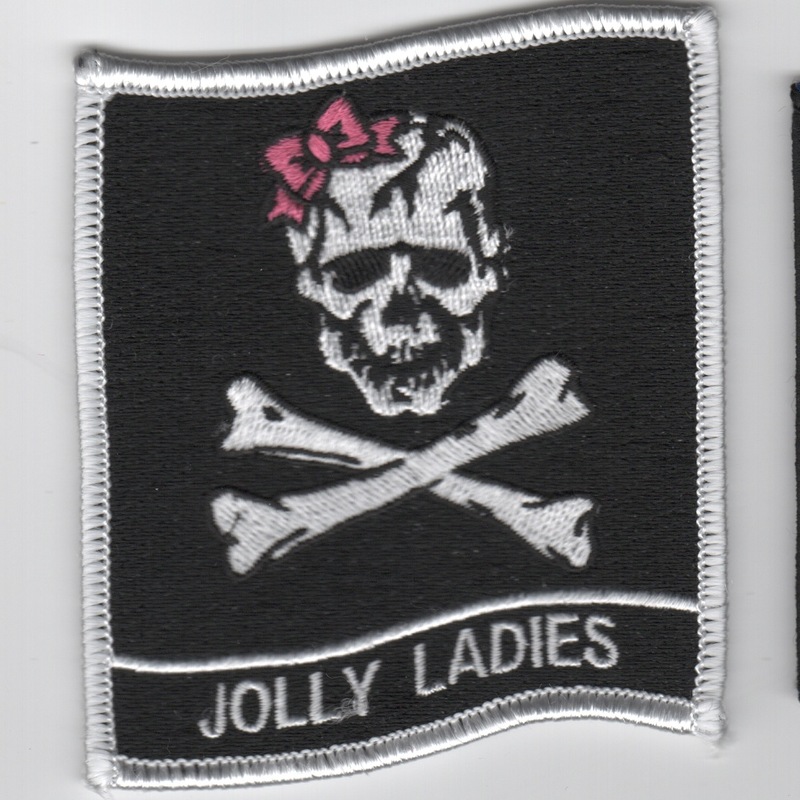 This is one of their "TAIL FIN" patches they created, and it says "JOLLY ROGERS". This patch does not come with velcro attached. 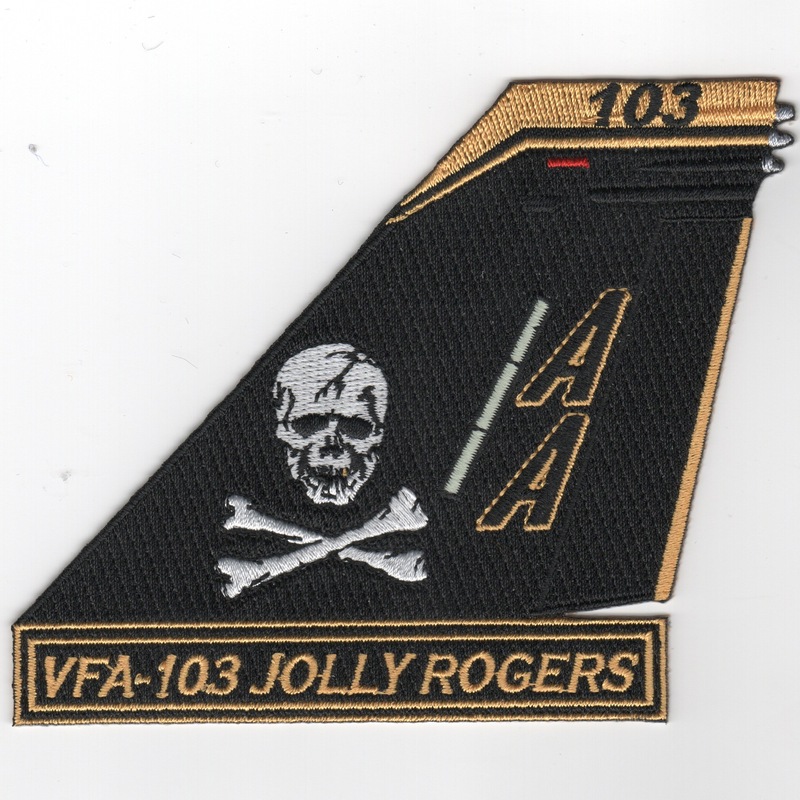 This is the black/white nametag for the pilots of VF-103 and does not have velcro attached. If you need your name embroidered on it, drop me an email and I'll let you know the pricing for that. 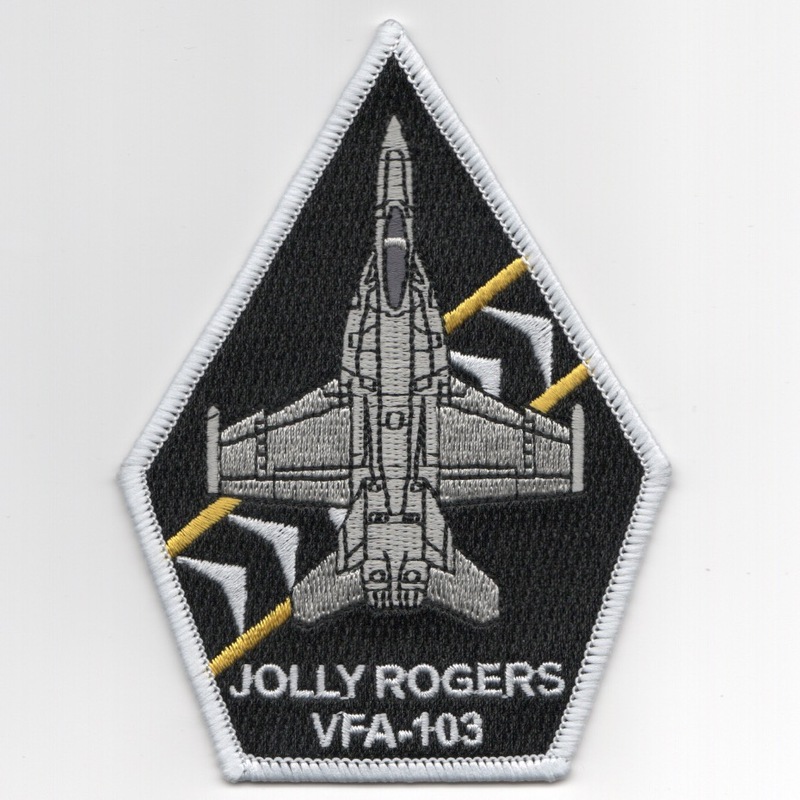 This is the color nametag for the Weapons System Officer (WSO) of VF-103 and does not have velcro attached. If you need your name embroidered on it, drop me an email and I'll let you know the pricing for that. 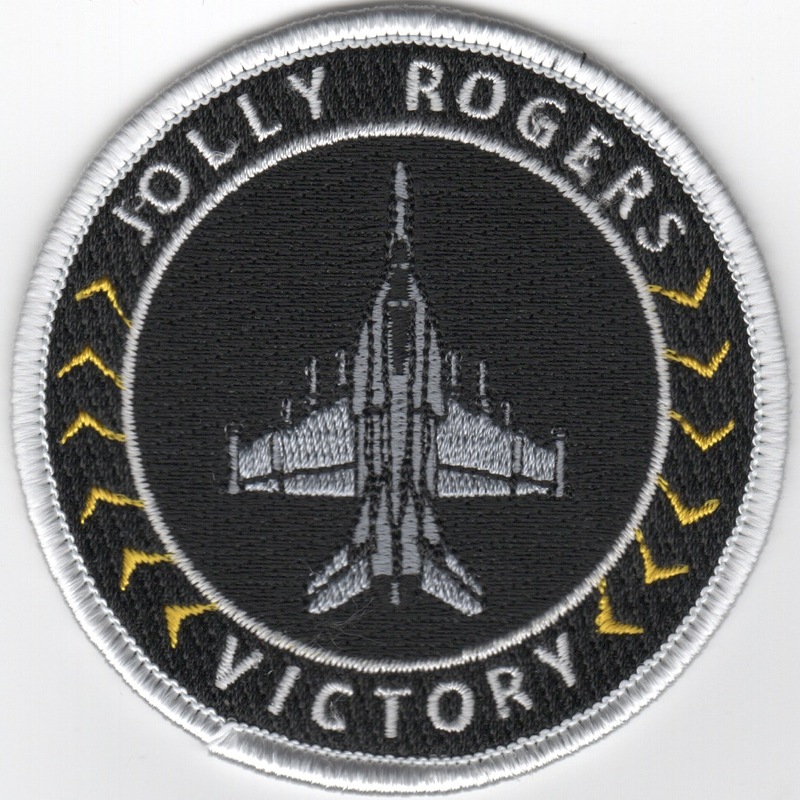 These are the desert nametags for the pilots for VF-103 and does not have velcro attached. If you need your name embroidered on it, drop me an email and I'll let you know the pricing for that. 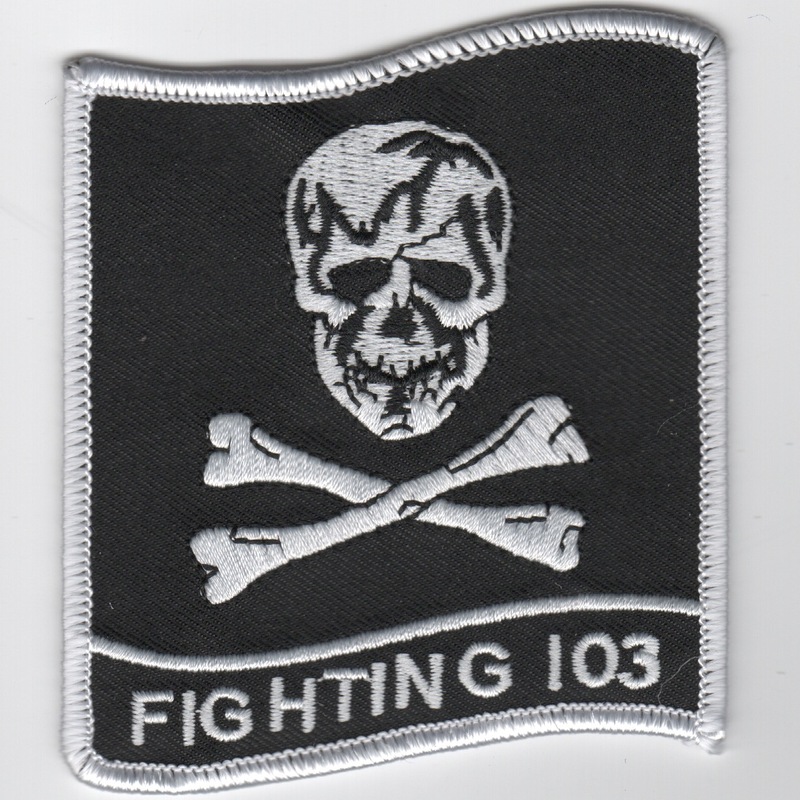 These are the desert nametags for the Weapons Systems Officer (WSO) for VF-103 and does not have velcro attached. If you need your name embroidered on it, drop me an email and I'll let you know the pricing for that. 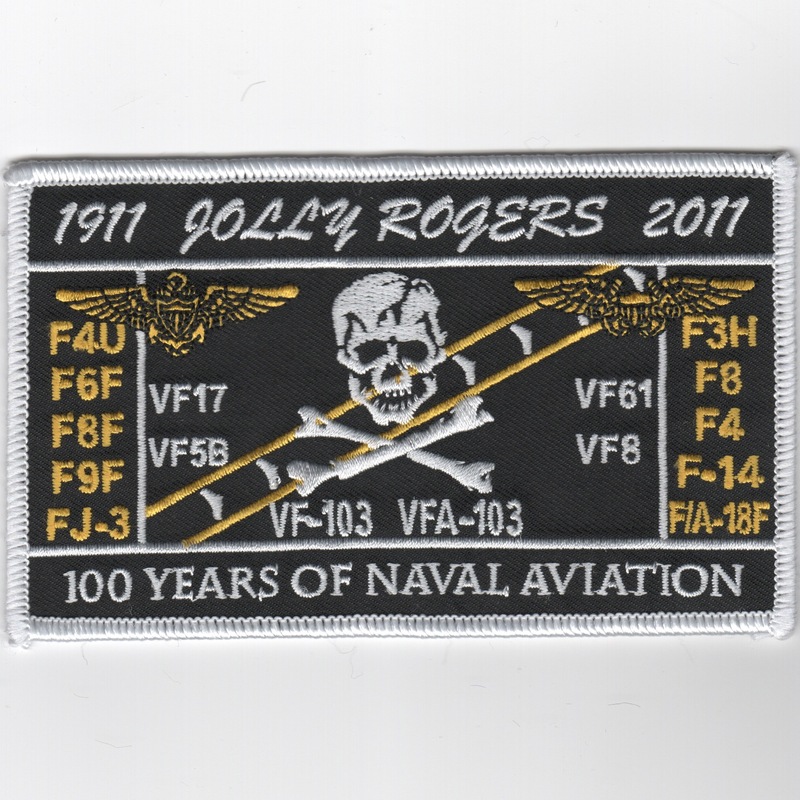 This is VFA-103's commemorative patch celebrating 100 years of Naval Aviation, showing all the types of aircraft flown during their squadron history. This patch does not come with velcro attached. 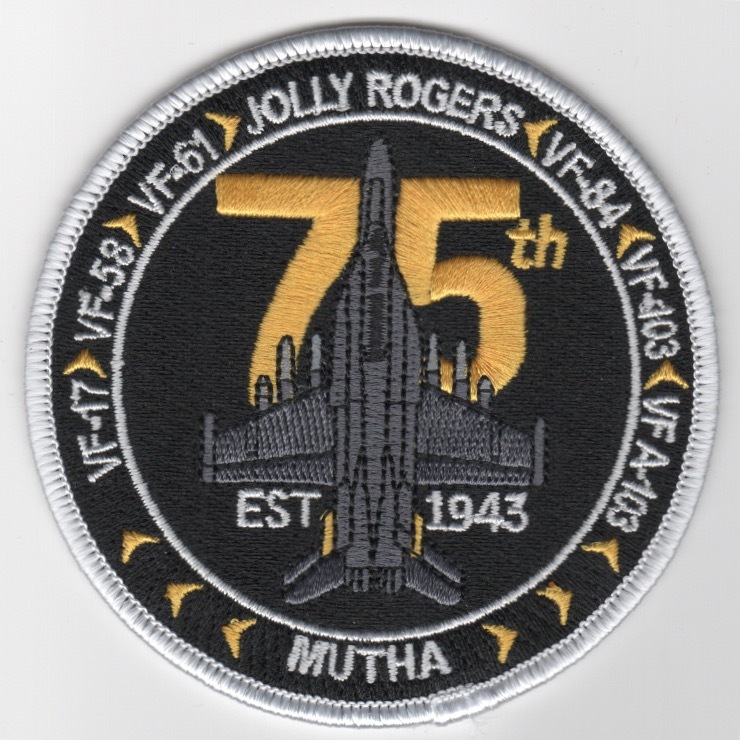 (Obtained from the squadron): This is VFA-103's commemorative patch celebrating the 75th anniversary of the famous Jolly Rogers squadron, listing all the aircraft flown during their squadron history. This patch does not come with velcro attached. VF-103 was established in May 1952 and began the transition from F-4S Phantoms to the F-14A Tomcat in January 1983 to their current aircraft, the F/A-18 Hornet. The 'Sluggers' were with the USS Saratoga in CVW-17 for the majority of her time, before switching to the USS Enterprise. VF-103 adopted the "Skull and Crossbones" of VF-84 to continue their tradition. VF-103 had one of their TARPS-birds shot down by an optical SA-2 derivative in Desert Storm with the pilot being rescued and the RIO becoming a POW. This is the 3.5-in version of their squadron patch and does not come with velcro attached. VF-103 was established in May 1952 and began the transition from F-4S Phantoms to the F-14A Tomcat in January 1983. The 'Sluggers' were with the USS Saratoga in CVW-17 for the majority of her time, before switching to the USS Enterprise. VF-103 adopted the "Skull and Crossbones" of VF-84 to continue their tradition. VF-103 had one of their TARPS- birds shot down by an optical SA-2 derivative in Desert Storm with the pilot being rescued and the RIO becoming a POW. This is the 4-inch tall version of their squadron patch and does not come with velcro attached. VFA-103 was established in May 1952 and began the transition from F-4S Phantoms to the F-14A Tomcat in January 1983. The 'Sluggers' were with the USS Saratoga in CVW-17 for the majority of her time, before switching to the USS Enterprise. VF-103 adopted the "Skull and Crossbones" of VF-84 to continue their tradition. VF-103 had one of their TARPS-birds shot down by an optical SA-2 derivative in Desert Storm with the pilot being rescued and the RIO becoming a POW. This is the desert version of their squadron patch. VF-103 was established in May 1952 and began the transition from F-4S Phantoms to the F-14A Tomcat in January 1983. The 'Sluggers' were with the USS Saratoga in CVW-17 for the majority of her time, before switching to the USS Enterprise. VF-103 adopted the "Skull and Crossbones" of VF-84 to continue their tradition. VF-103 had one of their TARPS-birds shot down by an optical SA-2 derivative in Desert Storm with the pilot being rescued and the RIO becoming a POW. 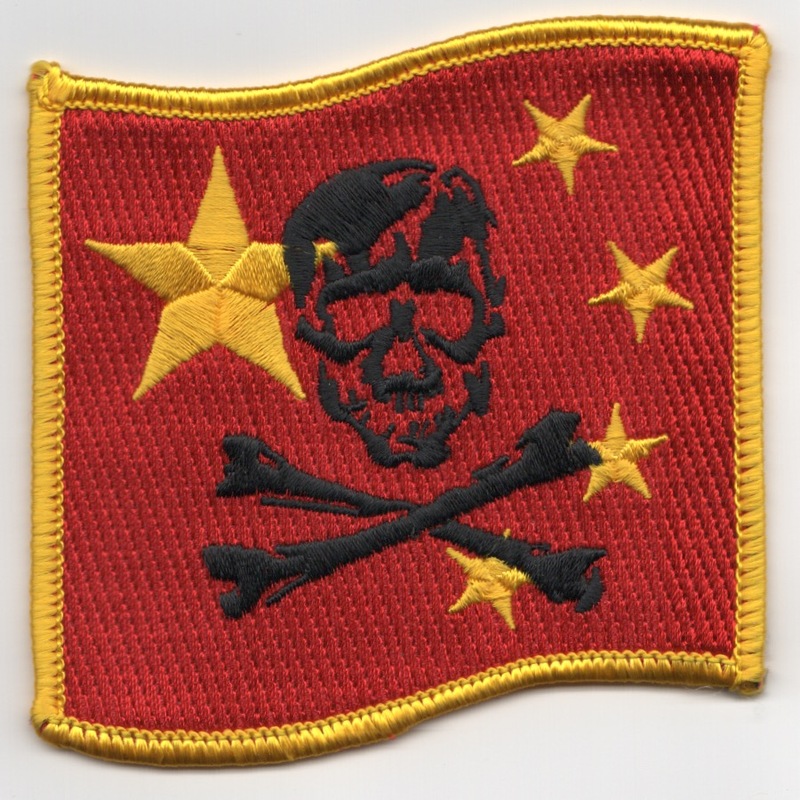 This is the 'RED AIR' version of their squadron patch used when they play the 'adversary' role and does not come with velcro attached. VF-103 was established in May 1952 and began the transition from F-4S Phantoms to the F-14A Tomcat in January 1983. The 'Sluggers' were with the USS Saratoga in CVW-17 for the majority of her time, before switching to the USS Enterprise. VF-103 adopted the "Skull and Crossbones" of VF-84 to continue their tradition. VF-103 had one of their TARPS-birds shot down by an optical SA-2 derivative in Desert Storm with the pilot being rescued and the RIO becoming a POW. This is the "Ladies" version of their squadron patch and does not come with velcro attached. 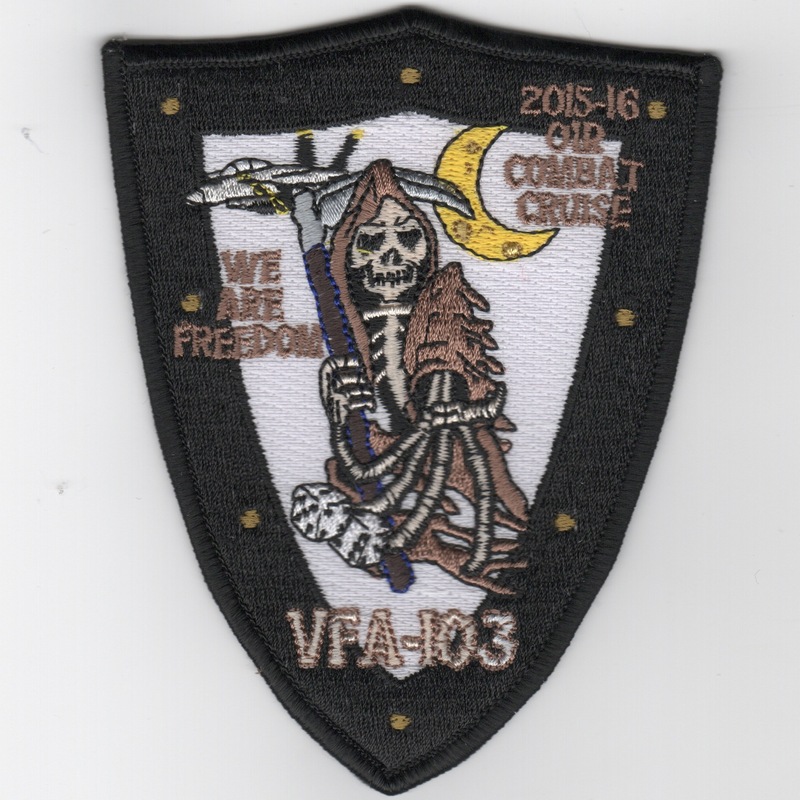 This is VFA-103's cruise patch for their 2015-2016 Operation Inherent Resolve (OIR) cruise. It says "WE ARE FREEDOM" and shows the "Grim Reaper" dealing the dice.....This patch does not come with velcro attached. 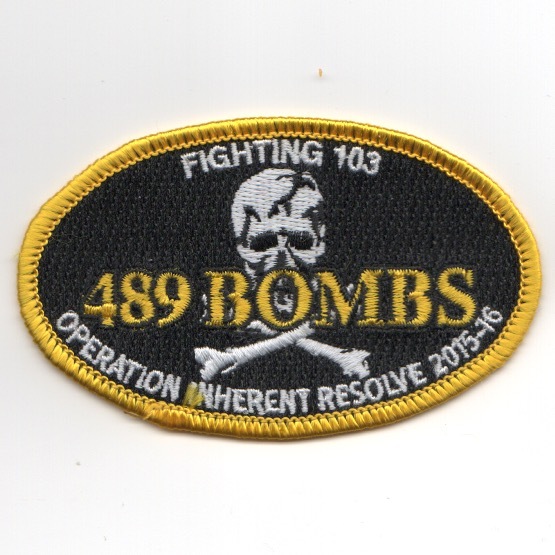 This is one of VFA-103's cruise patches for their 2015-2016 Operation Inherent Resolve (OIR) cruise. It says "489 BOMBS" and their cruise info along the bottom. This patch does not come with velcro attached. 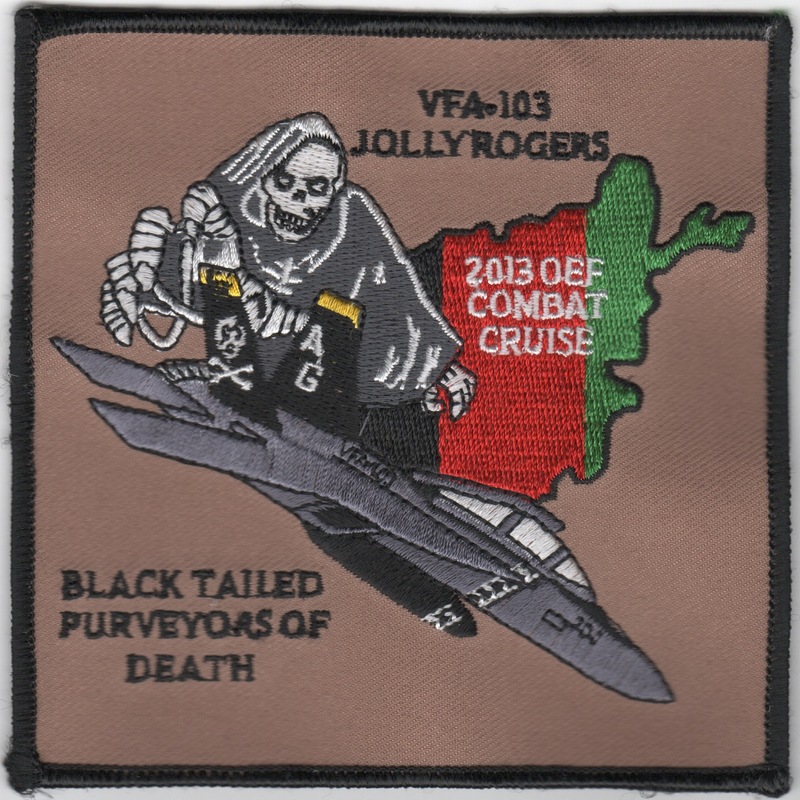 This is VFA-103's cruise patch for their 2013 Operation Enduring Freedom (OEF) cruise. It says "Black Tailed Purveyors of Death" and shows the F/A-18 Hornet over Afghanistan. This patch does not come with velcro attached. VFA-103 "family line" was established in May 1952 and began the transition from F-4S Phantoms to the F-14A Tomcat in January 1983, then to the F/A-18F in Dec 2004. 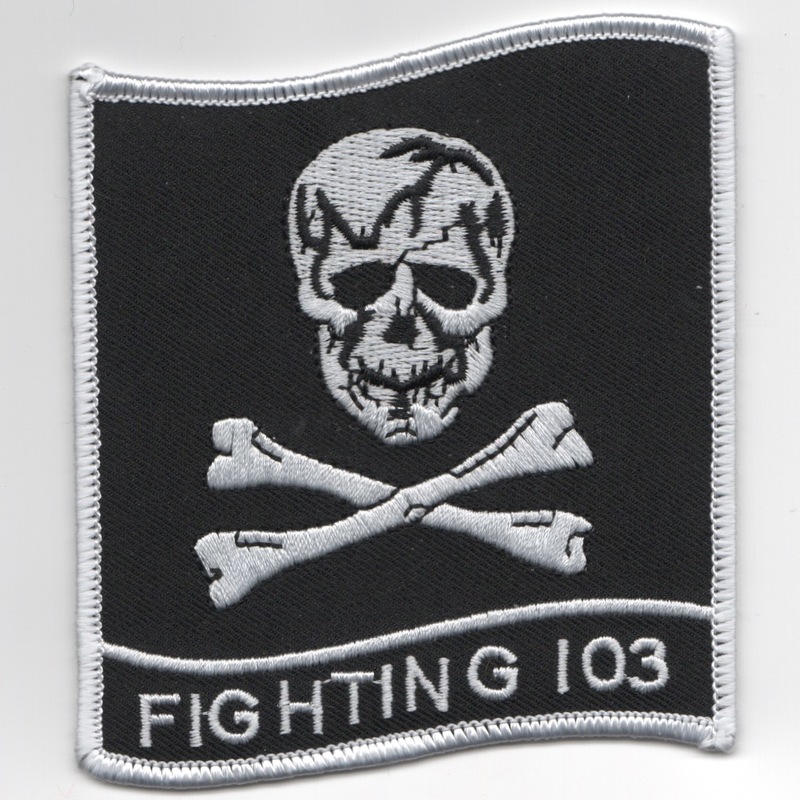 This is the first COMBAT cruise patch they issued. 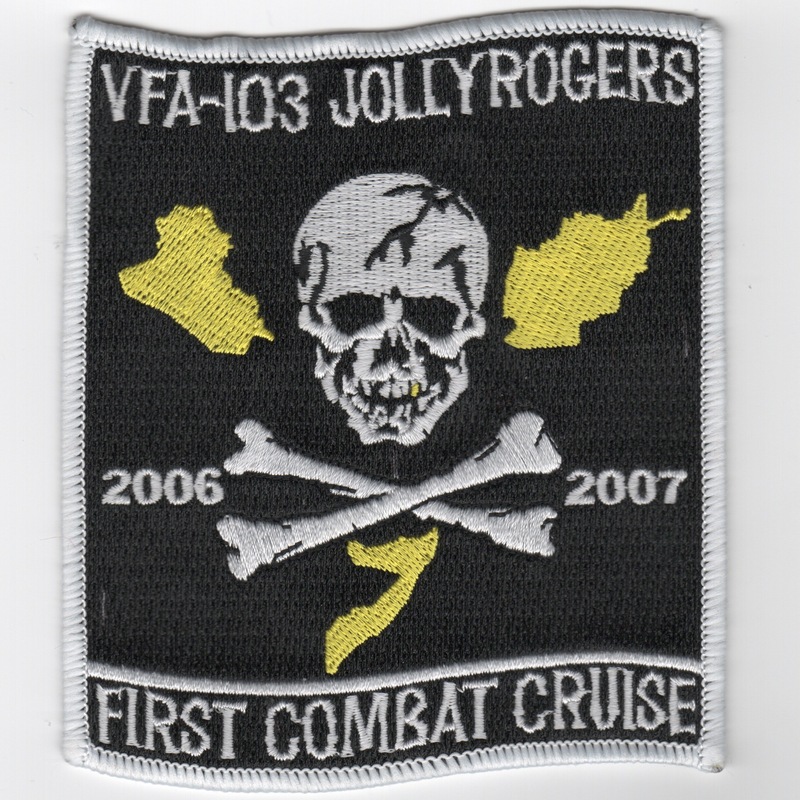 It says "First COMBAT Cruise 2006-2007". This patch does not come with velcro attached. VFA-103's "family line" was established in May 1952 and began the transition from F-4S Phantoms to the F-14A Tomcat in January 1983, then to the F/A-18F in Dec 2004. 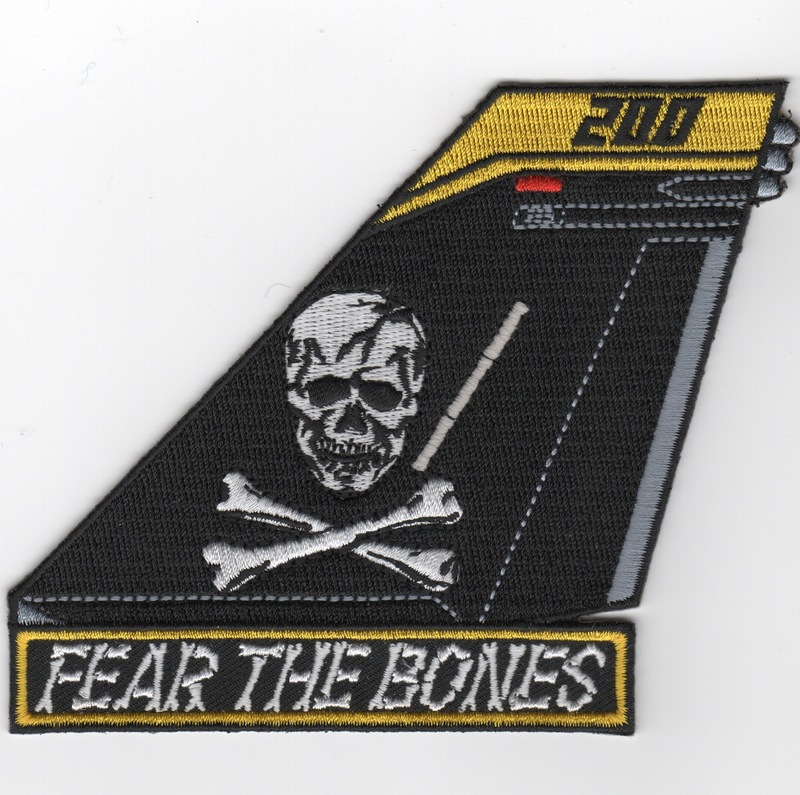 This is F/A-18 "TAIL FIN" patch they created, and it says "FEAR THE BONES". This patch does not come with velcro attached. VF-103 was established in May 1952 and began the transition from F-4S Phantoms to the F-14A Tomcat in January 1983. The 'Sluggers' were with the USS Saratoga in CVW-17 for the majority of her time, before switching to the USS Enterprise. VF-103 adopted the "Skull and Crossbones" of VF-84 to continue their tradition. 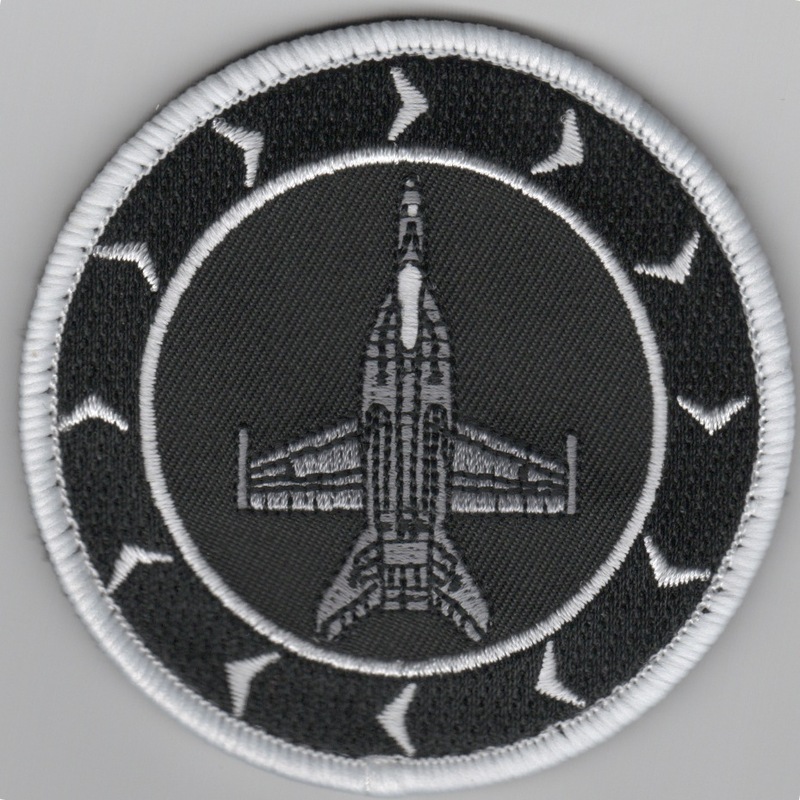 They have now transitioned to the F/A-18 Hornet and this is their round "black" version of their transition patch that states "Transition Time, Baby". VFA-103 was established in May 1952 and began the transition from F-4S Phantoms to the F-14A Tomcat to the F/A-18F SuperHornet in 2005. The 'Sluggers' were with the USS Saratoga in CVW-17 for the majority of her time, before switching to the USS Enterprise. VF-103 adopted the "Skull and Crossbones" of VF-84 to continue their tradition. VF-103 had one of their TARPS-birds shot down by an optical SA-2 derivative in Desert Storm with the pilot being rescued and the RIO becoming a POW. 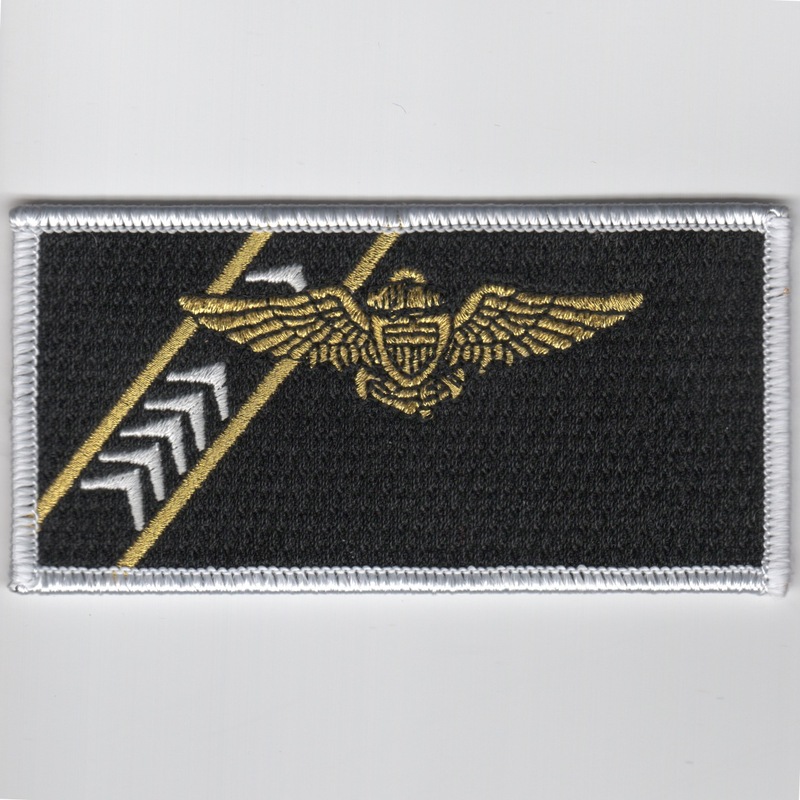 This is the plain black version (no letters and white chevrons) of their "Victory" bullet patch created by them and does not come with velcro attached. VFA-103 was established in May 1952 and began the transition from F-4S Phantoms to the F-14A Tomcat to the F/A-18F SuperHornet in 2005. The 'Sluggers' were with the USS Saratoga in CVW-17 for the majority of her time, before switching to the USS Enterprise. VF-103 adopted the "Skull and Crossbones" of VF-84 to continue their tradition. VF-103 had one of their TARPS-birds shot down by an optical SA-2 derivative in Desert Storm with the pilot being rescued and the RIO becoming a POW. 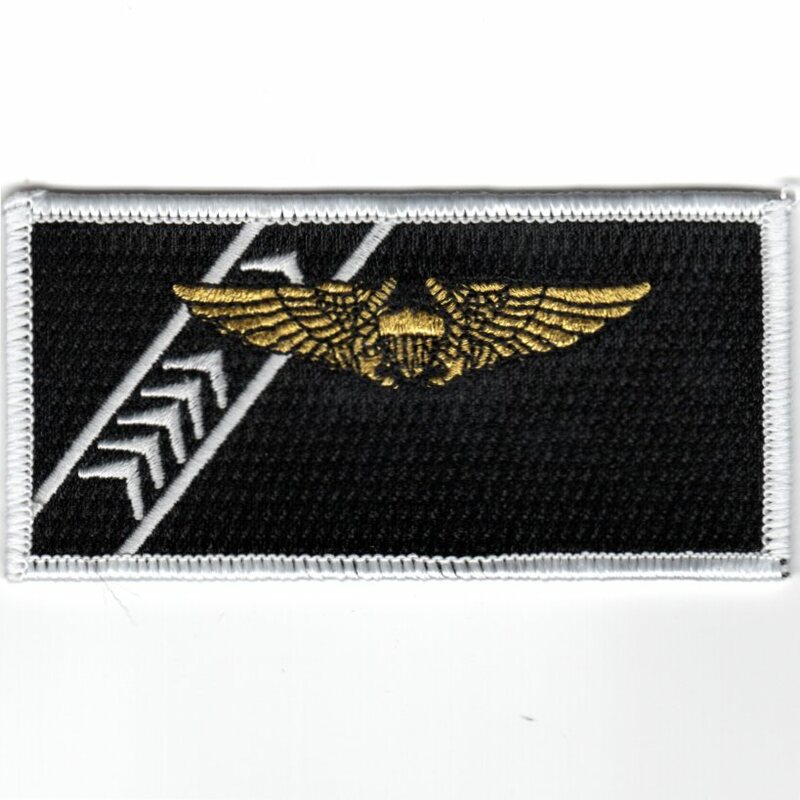 This is the plain black version (no letters and white chevrons) of their "Victory" bullet patch created by them and does come with velcro attached. VFA-103 was established in May 1952 and began the transition from F-4S Phantoms to the F-14A Tomcat to the F/A-18F SuperHornet in 2005. The 'Sluggers' were with the USS Saratoga in CVW-17 for the majority of her time, before switching to the USS Enterprise. VF-103 adopted the "Skull and Crossbones" of VF-84 to continue their tradition. VF-103 had one of their TARPS-birds shot down by an optical SA-2 derivative in Desert Storm with the pilot being rescued and the RIO becoming a POW. This is the black version of their "VICTORY" bullet patch created by them and does come with velcro attached. VFA-103 was established in May 1952 and began the transition from F-4S Phantoms to the F-14A Tomcat to the F/A-18F SuperHornet in 2005. The 'Sluggers' were with the USS Saratoga in CVW-17 for the majority of her time, before switching to the USS Enterprise. VF-103 adopted the "Skull and Crossbones" of VF-84 to continue their tradition. VF-103 had one of their TARPS-birds shot down by an optical SA-2 derivative in Desert Storm with the pilot being rescued and the RIO becoming a POW. 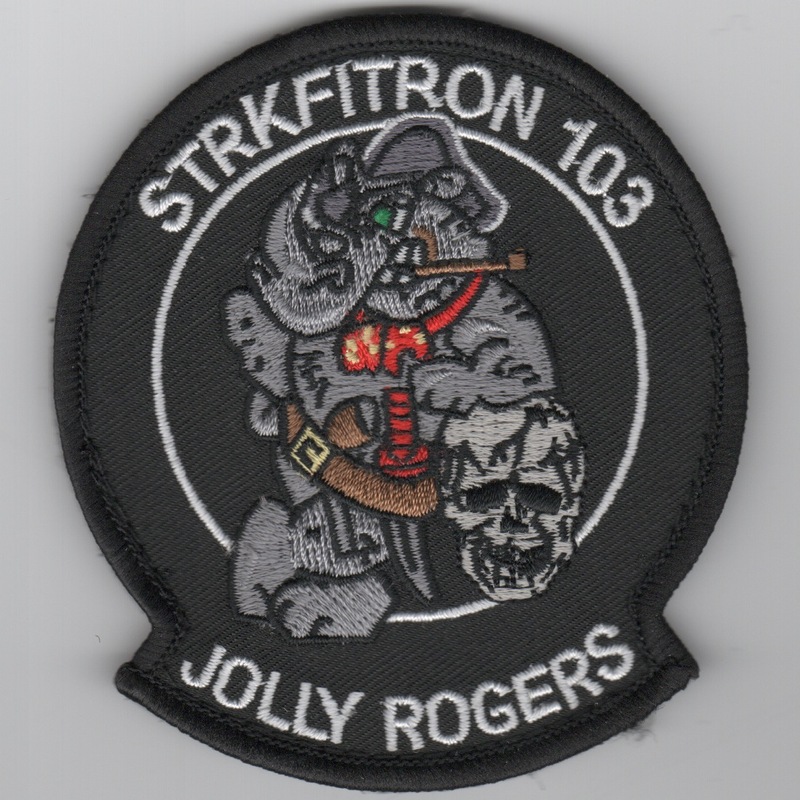 This is the "spinoff" patch created by the Hornet crews (Rhinos) in imitation of the old Tomcat patches where Felix was leaning on the skull. This patch does come with velcro attached. VFA-103 was established in May 1952 and began the transition from F-4S Phantoms to the F-14A Tomcat to the F/A-18F SuperHornet in 2005. The 'Sluggers' were with the USS Saratoga in CVW-17 for the majority of her time, before switching to the USS Enterprise. VF-103 adopted the "Skull and Crossbones" of VF-84 to continue their tradition. VF-103 had one of their TARPS-birds shot down by an optical SA-2 derivative in Desert Storm with the pilot being rescued and the RIO becoming a POW. This is the current version of their new "oval" patch. (Obtained from the squadron): VFA-103 was established in May 1952 and began the transition from F-4S Phantoms to the F-14A Tomcat to the F/A-18F SuperHornet in 2005. The 'Sluggers' were with the USS Saratoga in CVW-17 for the majority of her time, before switching to the USS Enterprise. VF-103 adopted the "Skull and Crossbones" of VF-84 to continue their tradition. VF-103 had one of their TARPS-birds shot down by an optical SA-2 derivative in Desert Storm with the pilot being rescued and the RIO becoming a POW. This is the current version of their new F/A-18 aircraft "diamond" patch and does not come with velcro attached. VFA-103 was established in May 1952 and began the transition from F-4S Phantoms to the F-14A Tomcat in January 1983. The 'Sluggers' were with the USS Saratoga in CVW-17 for the majority of her time, before switching to the USS Enterprise. VF-103 adopted the "Skull and Crossbones" of VF-84 to continue their tradition. VF-103 had one of their TARPS-birds shot down by an optical SA-2 derivative in Desert Storm with the pilot being rescued and the RIO becoming a POW. This is the large, black-bordered version of their squadron "backpatch" version of their squadron patch and does not have velcro attached. VFA-103 was established in May 1952 and began the transition from F-4S Phantoms to the F-14A Tomcat to the F/A-18F SuperHornet in 2005. The 'Sluggers' were with the USS Saratoga in CVW-17 for the majority of her time, before switching to the USS Enterprise. VF-103 adopted the "Skull and Crossbones" of VF-84 to continue their tradition. VF-103 had one of their TARPS-birds shot down by an optical SA-2 derivative in Desert Storm with the pilot being rescued and the RIO becoming a POW. 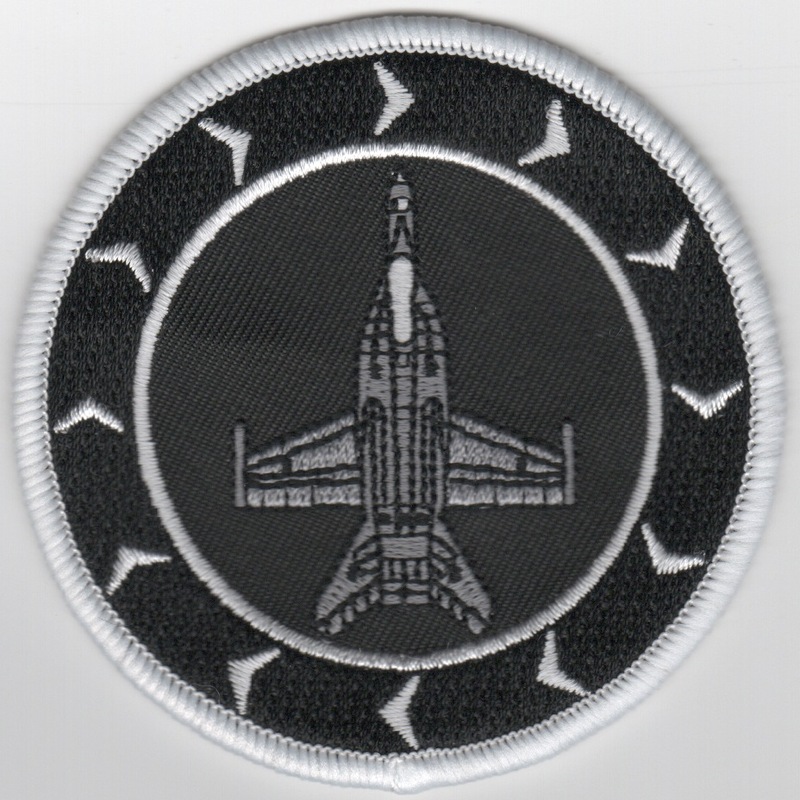 This is the current version of their squadron "backpatch" and does not have velcro attached. VF-103 was established in May 1952 and began the transition from F-4S Phantoms to the F-14A Tomcat in January 1983. The 'Sluggers' were with the USS Saratoga in CVW-17 for the majority of her time, before switching to the USS Enterprise. VF-103 adopted the "Skull and Crossbones" of VF-84 to continue their tradition. VF-103 had one of their TARPS-birds shot down by an optical SA-2 derivative in Desert Storm with the pilot being rescued and the RIO becoming a POW. This is the patch worn by the enlisted maintainers that were responsible for a particular jet. It was known as their "bird", and it is quite an honor to have one that you are responsible for. This version of the P.C. 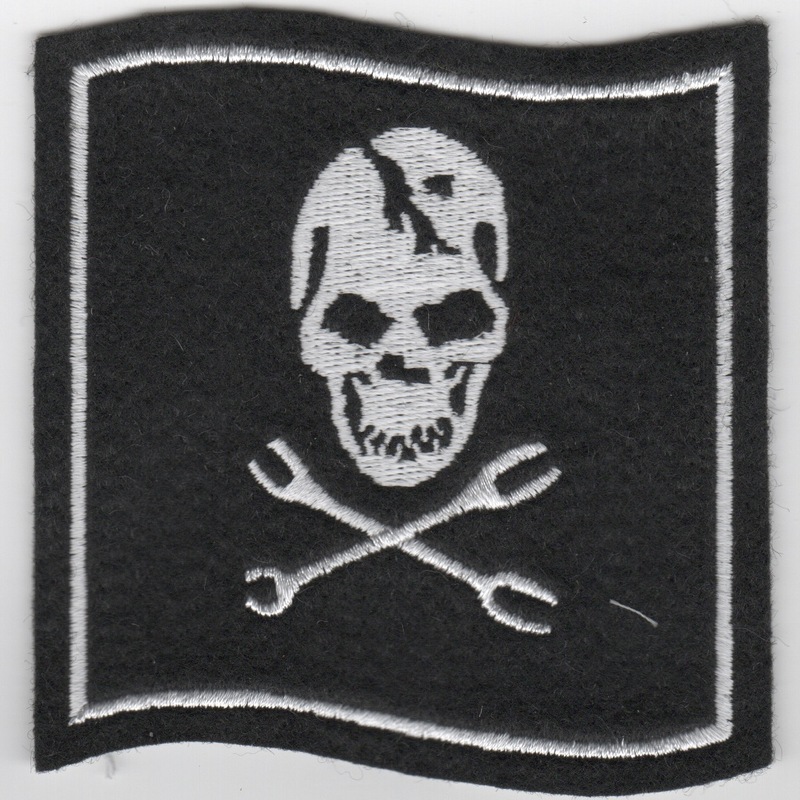 patch feels like "felt" and shows "wrenches" instead of "BONES" for the squadron logo. This patch does not come with velcro attached. 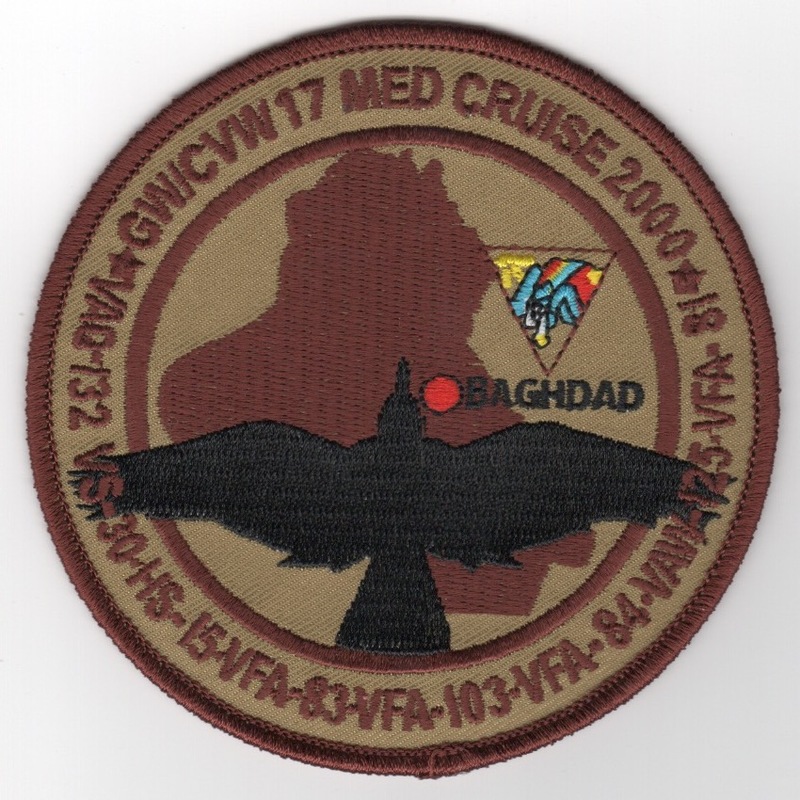 This is the cruise patch for the CVW-17 2000 MED cruise. It depicts the "Black Bird" over Iraq with the Airwing Logo over the text "BAGHDAD". This patch does not come with velcro attached. 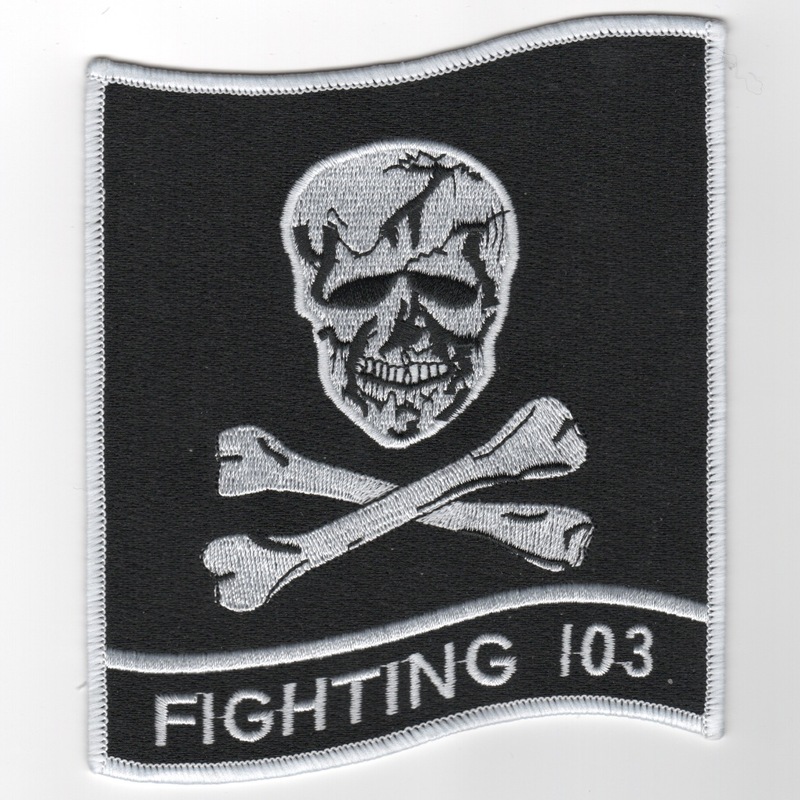 Homepage | Order VFA-103 Patches!